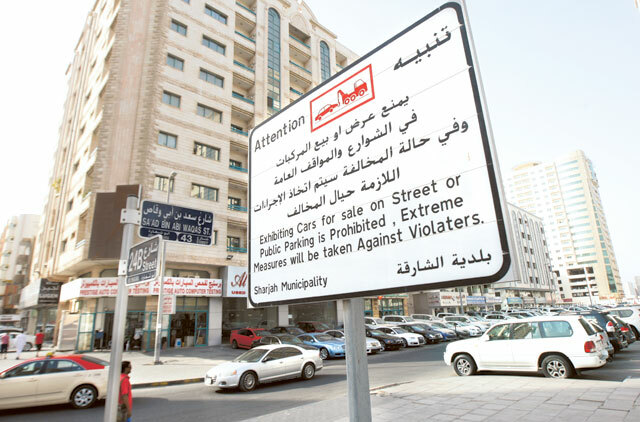 Sharjah: Used car dealers in Abu Shagara have been warned not to take up public spaces after complaints from local residents. The dealers are already prohibited from using parking lots but are ignoring the law, meaning residents have just a handful of spaces available, forcing them to risk fines by parking in unauthorised areas. Mohammad Musharraf, a longtime resident of the area, said: “What is happening here in Abu Shagara is really unfair. The parking spaces meant for the public are totally occupied by these showroom owners. “They even occupy the pavements, but when we park our cars on the pavements or on the side of the buildings we are penalised by the municipality inspectors. “It is impossible to drive on the internal roads at times, particularly on Friday evenings, as all the commercial activities take place on the roads. However, Eng Sultan al Mualla, Director General of Sharjah Municipality, blamed the problem on a delay in relocating the area’s car market, which was supposed to have been moved by 2010. Al Mualla stressed that in the long run, the used car market will be relocated to an Auto Zone Market near Sharjah International Airport. “We are in the final phases of designing the auto market and cannot be certain when it will be approved as it has to go through several authorities before reaching the Ruler’s office,” he said.